Pink blush adds dimension and glow to a fair complexion. Fair skin can appear radiant and youthful, and is elevated when paired with a subtle pink blush. It's easier to embrace a fair complexion rather than fighting it in favor of a bronzed look; not only does it requires less maintenance, but it's also healthier for your skin in the long run. Trading in the bronzers and self tanners, and perfecting the English rose look, is possible with the right tools in your makeup bag. Hydrate your skin with a moisturizer with SPF made specifically for the face. Massage it into damp skin using a circular motion to prevent sun damage and serve as a base for makeup. Prime the face with a tone-correcting makeup primer. Use a moisture-enriched primer through winter months for added hydration, and opt for a mattifying primer in the summer to keep shine at bay. Dampen a clean makeup wedge with cold water and wring it out thoroughly. Apply a foundation in the desired shade using the sponge. Pat it on gently for even coverage. Allow the foundation to set completely. 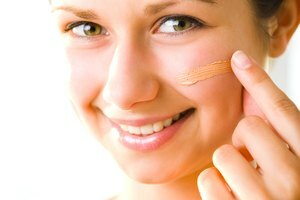 Apply concealer in one shade lighter than the foundation to any dark spots or uneven areas. Use a creamy, hydrating concealer to avoid chalky look. Blend the concealer in thoroughly in a circular motion using a small concealer brush. Dip a large powder brush into a fair-toned loose powder, and apply it gently all over the face to set the makeup. Apply a light pink blush to the cheeks using a blush brush. Use a small amount, as the pink tone will pop with ease on fair skin. Apply directly to the apples of the cheeks and blend upwards towards the hairline for natural definition. Select a cream blush for a dewy finish, or opt for a powder blush for a matte look. Can I Apply NYC Bronzer All Over My Face? O'Neil, Celeigh. "How to Get a Pale Complexion With Pink Cheeks." 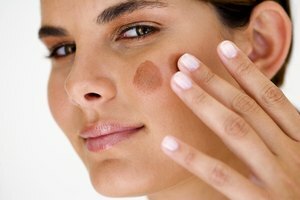 Synonym, https://classroom.synonym.com/pale-complexion-pink-cheeks-11757.html. Accessed 25 April 2019.